Nietzsche’s Philosophy of Education makes the case that Nietzsche’s ​philosophy has ​significant import for the theory and contemporary practice of education, arguing that ​some of ​Nietzsche​'s most important ​ideas ​have been misunderstood by ​previous ​interpreters. ​In ​providing novel reinterpretations of ​Nietzsche's ​ethical theory, political​ philosophy​ and philosophical anthropology ​and outlining concrete ways in which ​these ideas can enrich teaching and learning in modern democratic schools, the book sets itself apart​ from previous works on Nietzsche​. 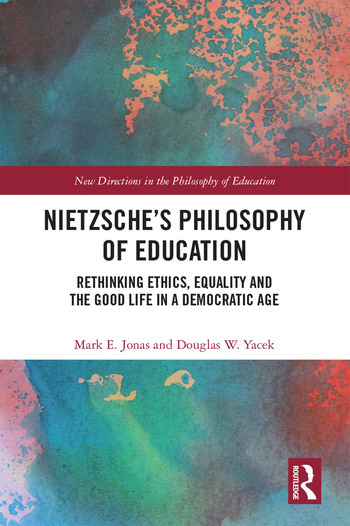 This is one of the first ​extended engagements with Nietzsche’s philosophy ​which attempts to determine his true legacy for democratic education. ​In its engagement with both the vast secondary literature on Nietzsche's philosophy and the educational implications of his philosophical vision, this book makes a unique contribution to both the philosophy of education and Nietzsche scholarship. In addition, its ​development of four concrete pedagogi​cal approaches from Nietzsche's educational ideas ​makes the book a potentially helpful guide to meeting the practical challenges of ​contemporary teaching. This book will be of great interest to Nietzsche scholars, researchers in the philosophy of education and　​​students studying educational foundations. Mark E. Jonas is Associate Professor of Education and Associate Professor of Philosophy (by courtesy) at Wheaton College in Illinois. Douglas W. Yacek is Research Fellow and Lecturer in the Leibniz School of Education and the Institute for Special Education in the Faculty of Philosophy at the Leibniz University Hannover in Germany.